Place all spice rub ingredients together in a large zip lock bag. Shake to mix spices together. Pat dry chicken inside and out with paper towels and place into the zip lock bag. Shake to evenly coat the chicken. Choose your preferred flavour of wood chips and use a wood chip soaker to soak 100g of chips in water for at least 30 minutes. For best results, pre-soak wood chips for between 2-3 hours. Pre-heat BBQ on high for 10 minutes. Drain wood chips and place them into a stainless steel Smoker Box. Place smoker box on the hot grill for 5 minutes until chickens begin to smoke. Place roasting rack into an enamel roasting tray and gently lay the chicken over the rack. Transfer the tray to the BBQ. To cook, switch off the burners directly below the roasting tray and allow the surrounding heat to cook the chicken. Ensure you close the hood of the BBQ when cooking. Reduce the heat to 120°C and cook for 4 hours or until the internal temperature of the chicken reaches 75°C. Use a digital prong thermometer, inserting it into the thickest part of the chicken, to get an accurate temperature reading. 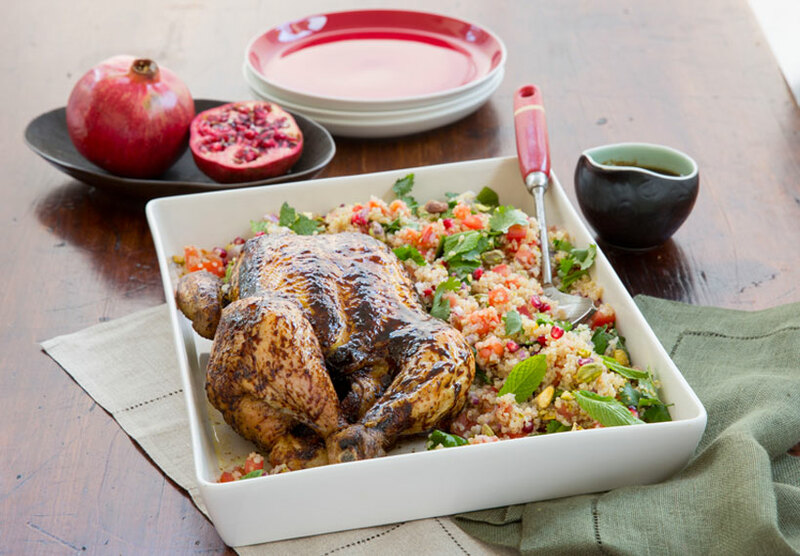 Remove chicken from the BBQ and brush lightly with pomegranate molasses. For the salad, place chicken stock and quinoa in a small saucepan, cook over a high heat for 10 minutes, cover for 2-3 minutes until all the liquid is absorbed. Set aside to cool. Place all the remaining salad ingredients into a bowl and lightly toss together. Place the dressing ingredients into a small bowl and whisk to combine, toss the dressing through the salad just before serving.